With “Collateral Damage,” I commemorate the lives of civilians killed in the war in Iraq. Each civilian life lost is represented with an “X.” Of a total of 600,000 civilans killed as estimated by the New York Times (October 10, 2006), the pages in the Place Gallery exhibit tallied over 300,000. Each piece is set in an unfinished pine frame. The final exhibition will fill a room completely. This work is also performed in public as an intervention in an attempt to draw attention to the daily catastrophe and to encourage dialog. An intervention consists of me simply sitting at a table marking pages with X’s. A copy of the New York Times article is on hand. What does a word mean when it is used so widely to manipulate public opinion. How do we respond to the feelings of violation, theft, paranoia, and grief that terror wrecks on our society? There are two distinct facets to this project, one a fine art piece for gallery viewing, the second a street graphic designed to fit over newspaper box windows. I am interested in recontextualizing images and words to reveal new meanings. 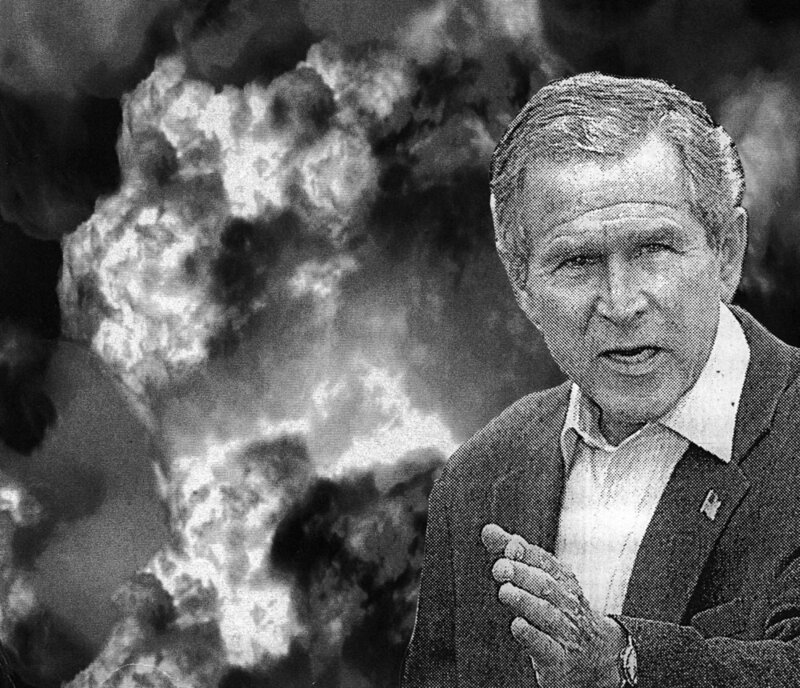 Through his actions, George Bush has made all of America a target. This piece was censored by the arts publication that originally commissioned it, and subsequently rejected by a printer based on its political content. Next it was printed as the subject of an article in a different arts journal who was warned against reproducing the image by the ACLU. The final version was created for the “Sedition” group show at the Mark Woolley Gallery. Like father, like son. As George Bush Jr. began his invasion and bombing of Iraq, I reprised a sticker that I made more than a decade earlier. Adaptation of John Heartfield's photomontage "Adolf, Superman"